A funeral for a friend or loved one can be difficult, but funeral flowers from A TOUCH OF SPRING FLORIST of Macclenny, Florida (FL) can help begin the healing process. Funeral flowers provide the opportunity to express how much the departed means to you. Celebrate the life of your loved one with one of the beautiful funeral flower arrangements found here such as: Classic Remembrance Urn, Mixed Flowers Sympathy Tribute or one of our Standing Sprays. Browse our funeral flowers page to find the perfect sympathy arrangement and place your order online. You can also call and speak with a designer at A TOUCH OF SPRING FLORIST in Macclenny, Florida (FL) for funeral flowers just as unique as your friend or loved one. If you are looking for standing funeral sprays in Macclenny, A TOUCH OF SPRING FLORIST can help. We specialize in funeral flowers and can create the perfect memorial for your final tribute. 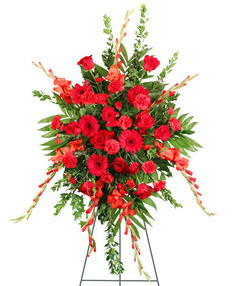 Order your floral standing spray online or call us at (800) 645-0360 for something more custom. For quality casket flowers in Macclenny, look no further than your neighborhood florist, A TOUCH OF SPRING FLORIST. We can create something to match the style and personality of your departed loved one. 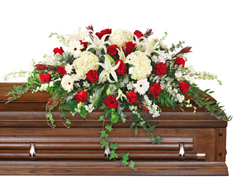 Give us a call at (800) 645-0360 or order your casket flowers online below. We also create memorial flowers for cremation services.